Did anybody score any of those Sqaudts from Canada here? Some went for some decent prices!! damn i didn't even see this on ebay, what was for sale? tb 7, tb 45? any others? Anyone else see this? Too funny. Damn it! Waited a min to long to pull the trigger. FB Jack just went for $75. Shipped! Need an extra one for some custom fodder! Goddamnanalog wrote: Damn it! Waited a min to long to pull the trigger. FB Jack Chipp just went for $75. Shipped! It's not that same listing that has the Jack listed as a Chipp. And if it was a Chipp for $75 I would be even more pissed. Goddamnanalog wrote: Damn it! Waited a min to long to pull the trigger. FB Jack just went for $75. Shipped! I'm sure you've seen this, but retail is not bad especially with free shipping. Free shipping is always a plus! But $20 off, damn that would of been a good deal! Nah, it's all good! Another will hopefully pop up! Goddamnanalog wrote: Free shipping is always a plus! But $20 off, damn that would of been a good deal! Nice score Okhrana, I couldn't pass on that Frozn Nozzel.....got some great ideas for that parka!! Swordfish wrote: Nice score Okhrana, I couldn't pass on that Frozn Nozzel.....got some great ideas for that parka!! Yep, scored it at the end! congrats on the Nozzels guy's ! He'd be lucky to get half of that. 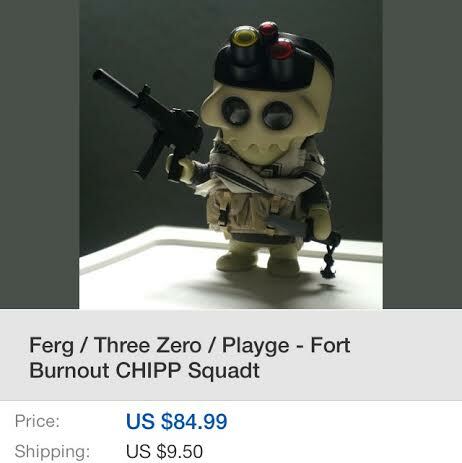 Seriously, you can get a Ferg or Brandt custom one- off for less money. Is that what those are going for? Shoot2Kill wrote: Is that what those are going for? $400-$500 depending on condition. I've never seen (of the two years I've been collecting) a brand spanking new one for sale. I assumed there are no more NEW condition reg mj's left let alone a gid chases. For a completest that has to have a MINT condition one I feel sorry for you.